Practitioners must understand the anatomy of the nasal bones before attempting any manipulation. The paired nasal bones project from the frontal processes of the maxilla, superiorly from the nasal process of the frontal bone, and join in the midline (see the image below). The quadrangular, or septal, cartilage supports the nasal bones from below. The lateral nasal walls contain 3 pairs each of small, thin, shell-like bones: the superior, middle, and inferior conchae, which form the bony framework of the turbinates. Lateral to these curved structures lies the medial wall of the maxillary sinus. 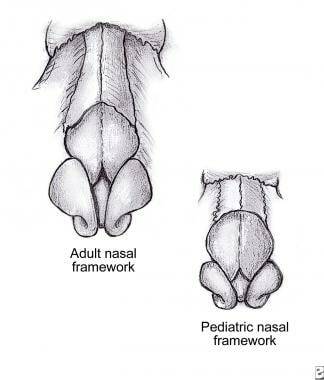 For more information about the relevant anatomy, see Nasal Anatomy. Most nasal fractures are diagnosed by history and physical examination. History usually includes a preexisting trauma, which may be followed by epistaxis. Typically, the epistaxis has resolved by the time the patient presents for intervention. Patients usually present with swelling over the nasal bridge and a difference in the appearance or shape of the nose. Physical examination findings include swelling over the nasal bridge, grossly apparent deviation of the nasal bones, and periorbital ecchymosis. Be sure to ask the patient how the external shape of the nose has changed since the fracture. This helps determine what corrective maneuvers should be taken to restore the patient’s appearance through reduction of the nasal fracture. Soak pledgets in oxymetazoline (Afrin), phenylephrine (Neo-synephrine), or lidocaine 1-2% with epinephrine 1:100,000. 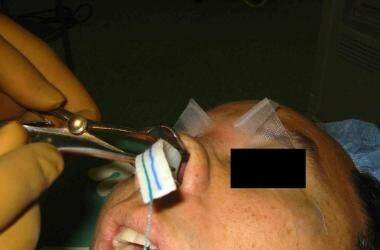 For vasoconstriction along with the use of infiltrative local anesthetic agents, see below. Place 1 pair of pledgets inside the nasal cavity (lying beneath the nasal dorsum, along the septum, and on the floor of the nose). See the image below. Remove pledgets after 10-15 minutes. For more information, see Local Anesthetic Agents, Infiltrative Administration. 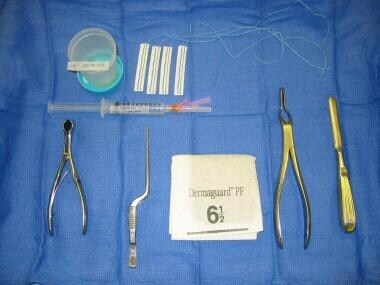 Equipment for nasal fracture reduction (clockwise from bottom left): nasal speculum, anesthetic for infiltration, anesthetic solution for pledgets, nasal pledgets, elevator, Asch forceps, sterile gloves. The practitioner and patient should each be in a position of comfort. A sitting or recumbent position with head elevated is usually tolerated well. C-spine precautions take precedence over comfort. Explain the risks, benefits, and alternatives to the patient. Obtain a signed informed consent, if possible. Deliver appropriate anesthesia. For details, see Anesthesia. To reduce nasal pyramids, measure the distance from the alar rim to the depressed fragment externally. Mark position with thumb. Reduce depressed side of nose first. Insert Boies or Salinger elevator into the nose under the depressed fragment. Apply steady outward pressure on the posterior aspect of the nasal bone. Control outward pressure with counterpressure exteriorly with the other thumb. Fragments may need to be molded into the proper position. If unable to reduce with elevators, use Walsham forceps to directly grasp the nasal bone. Insert one blade beneath the bone as the other blade is opposed on the outer skin surface. Manipulate the bone into position. Check for septal reduction. 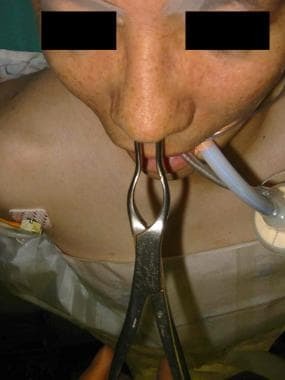 If not adequately reduced, use Asch forceps to elevate the nasal pyramid while applying direct pressure to the displaced portion of the septum until it is moved back into the proper position. Check for septal hematoma (drain if present). Stabilize reduction with internal packing (eg, Vaseline gauze or 8-cm Merocel) and an external splint (eg, Thermaplast, Aquaplast). These external splints require intense heat for activation and molding, so the nasal dorsal skin should be protected with Steri-Strip bandage application prior to placement of the splint. Remove packing in 5 days and remove nasal splint in 7 days. While the nasal packing is in place, the patient should be on an oral antibiotic with adequate Staphylococcus aureus coverage (eg, cephalexin) in order to prevent sinusitis and toxic shock syndrome. Routine radiography is not necessary for diagnosis and management of nasal fracture. Optimal timing for reduction varies. If patient presents with a recent injury and minimal edema, the optimal timing for reduction is within 3 hours of the injury (in both adults and children). If edema is significant, delay reduction until after edema has resolved but before the setting of fracture fragments (6-10 d after injury in adults; 3-7 d after injury in children). Referral to an ENT specialist or plastic surgeon is mandatory. Remember to check for septal hematomas before and after the procedure. Antibiotic prophylaxis is necessary for intranasal packing. Hemorrhage: Despite application of topical vasoconstrictors, excessive bleeding may occur. Direct pressure and intranasal packing is the treatment of choice. Coagulation studies may be indicated to detect patients who have bleeding diatheses. Laboratory tests for excessive blood loss may be indicated. Dysesthesia: Direct infiltration of local anesthesia carries the risk of nerve damage and may result in minor dysesthesias or paresthesias after the effects of the anesthetic diminish. Infection: Placement of intranasal packing may result in the development of sinusitis, or, less commonly, a toxic shock – like infection; provide adequate antibiotic prophylaxis. Preprocedural prophylaxis should be given to patients with coronary valvular disease. Atighechi S, Karimi G. Serial nasal bone reduction: a new approach to the management of nasal bone fracture. J Craniofac Surg. 2009 Jan. 20(1):49-52. [Medline]. Green KM. 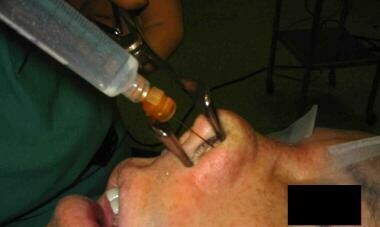 Reduction of nasal fractures under local anaesthetic. Rhinology. 2001. 39(1):43-46. Lee KJ. Essential Otolaryngology: Head and Neck Surgery. 8th ed. New York, NY: McGraw-Hill; 2003. 717-718. Kucik CJ, Clenney T, Phelan J. Management of acute nasal fractures. Am Fam Physician. 2004 Oct 1. 70(7):1315-20. [Medline]. Bailey BJ. Head and Neck Surgery: Volume 1. Philadelphia, PA: J.B. Lippincott Co; 1993. 443-446. Kerr AG. Scott-Brown's Otolaryngology. 6th. Oxford, England: Butterworth-Heinemann; 1997. 4/16/6-4/16/11. Desrosiers AE 3rd, Thaller SR. Pediatric nasal fractures: evaluation and management. J Craniofac Surg. 2011 Jul. 22(4):1327-9. [Medline]. Yabe T, Tsuda T, Hirose S. Reduction of nasal fracture using an airway tube as a pivot. J Craniofac Surg. 2011 Jul. 22(4):1430-1. [Medline]. Han DS, Han YS, Park JH. A new approach to the treatment of nasal bone fracture: the clinical usefulness of closed reduction using a C-arm. J Plast Reconstr Aesthet Surg. 2011 Jul. 64(7):937-43. [Medline]. DeFatta RJ, Ducic Y, Adelson RT, Sabatini PR. Comparison of closed reduction alone versus primary open repair of acute nasoseptal fractures. J Otolaryngol Head Neck Surg. 2008 Aug. 37(4):502-6. [Medline]. Paparella MM, Shumrick DA, Gluckman JL, Meyerhoff WL. Nasal Fractures. Otolaryngology. 3rd ed. Philadelphia, PA: WB Saunders Co; 1991. 1823-1830. Cummings CW, Fredrickson JM, Harker LA, et al. Nasal Fractures. Otolaryngology Head & Neck Surgery. 3rd ed. St. Louis, MO: Mosby; 1998. 866-882. 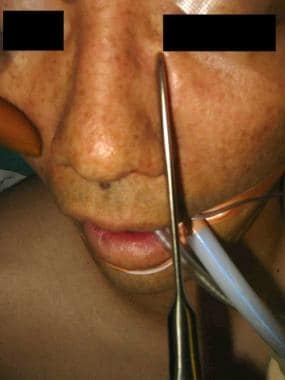 Jones TM, Nandapalan V. Manipulation of the fractured nose: a comparison of local infiltration anaesthesia and topical local anaesthesia. Clin Otolaryngol Allied Sci. 1999 Sep. 24(5):443-6. [Medline]. Disclosure: Received consulting fee from MiMosa for board membership; Received consulting fee from Spirox for consulting. The authors and editors of Medscape Reference would like to acknowledge the patients who allowed the use of their images for teaching purposes.